VANKLEEK HILL – The Christmas trees are ordered and the spirit of Christmas will be present in Vankleek Hill during the annual Christmas Home Tour, which takes place on Saturday, November 4, from 9 a.m. to 4 p.m. This year’s event features six heritage homes on the self-guided tour. This year’s decorators are: Cottage Blue Home (Cornwall), Donna Doucette (Vankleek Hill), Lise St-André (Vankleek Hill), Vankleek Cottage (Vankleek Hill), Auld Kirktown (Lancaster) and Belle Designs (Hawkesbury). Each decorator brings a special flair to each historic home. An additional hour has been added to this year’s tour, following last year’s sold-out event. And there are 300 new luncheon spaces available, thanks to even more participation from community organizations and new eateries in Vankleek Hill. Four churches are organizing luncheons, a quilt show, a Nativity Scene display, vendors along the town’s Main Street and carolers will add to the day. At 151 Main Street East, meet artist Susan Jephcott and see works from her recently-published book, “The Tangerine Cat”. Buy a book and have Jephcott sign it while you’re there! At Arbor Gallery at 36 Home Avenue, there is an art show of affordable small works to help you with your Christmas shopping list. That show is open from 10 a.m. to 4 p.m.
A quilt show takes place inside the church proper at Knox Presbyterian Church from 11 a.m. to 3 p.m. Specialty vendors and new this year, hot beverages will be offered outside of homes. Go home with your own souvenir of the day’s event by having your group’s photograph taken in a vintage sleigh, furnished for the occasion by Ouimet Farms Adventure, home of our local corn maze. Photographer Jan Amell will take good care of you and see that you are outfitted in Victorian capes, bonnets and the like to have just the right look. There will be a $5 charge to have your photo taken; one half of the proceeds will be donated to a local cause. Thanks to Nathalie Gratton and Hawkesbury’s Exit Premier Realty, four shuttle buses will take visitors from house to house in town and to other locations where special events are happening. You can also take home a unique Vankleek Hill souvenir on tour day. Be sure to pick up one of four collector edition Christmas ornaments, each featuring one of Vankleek Hill’s beautiful brick homes. Ornaments are on sale at The Review offices at 76 Main Street East in Vankleek Hill. This event is organized by The Review and shares proceeds with six community organizations, which provide volunteers to the event. To find out where to purchase $20 advance tickets (you can also purchase tickets online), to view the houses, luncheon information and more, visit: http://www.vankleekhill.ca/HomeTour. An example from last year’s Home Tour decor. won the Table416 . . . . everything on the table was worth $2,500! Congratulations to Julie on her win! WIN A BEAUTIFUL TABLE SETTING FOR 16! Included with ticket purchase is the chance to win this beautiful grand prize gift baskets) filled with home decor items, edibles and much more! Value: $500.00 !!!! Inclus avec votre billet : une chance de gagner ce magnifique panier cadeau rempli d’articles de décoration, de nourriture et plus! Une valeur de 500,00 $!!!! VANKLEEK HILL – The Christmas trees are ordered and the spirit of Christmas will be present in Vankleek Hill during the annual Christmas Home Tour, which takes place on Saturday, November 7. New energy and new ideas are a big part of this year’s home tour. Organized by The Review for about ten years now, Review publisher Louise Sproule decided to invite three community members to critique the event and suggest ideas to ramp up the popular tradition. “Decorators Lise St. André, Kim Veronneau and Josée Bonneville brought some new ideas and a revitalized direction to the event,” says Sproule. 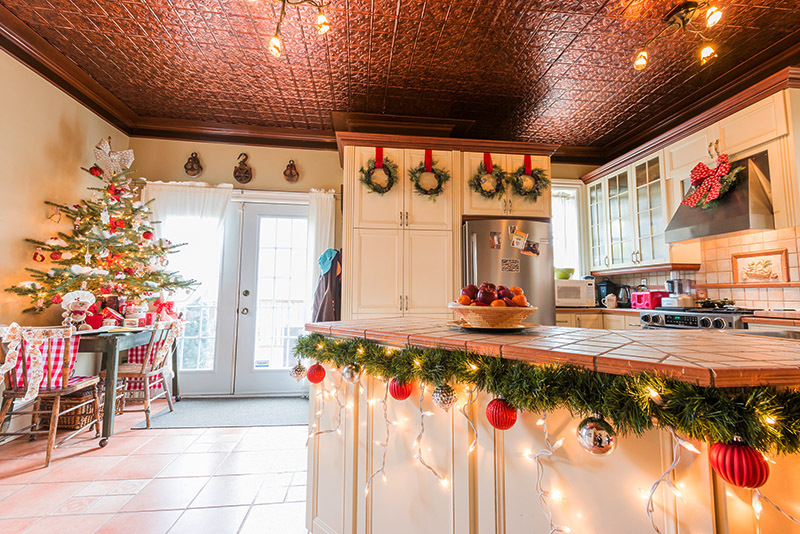 In addition to these three, who are also participating as decorators of homes, Donna Doucette, Lorel Crawford, Grace Clermont and Bridget MacDonald are also decorators adding their talent to the mix. Sproule is pleased to still count on Lisa Henderson as her volunteer coordinator. Review staff also kick in time and work to the event; the proceeds are divided among six community organizations each year and in turn, organizations provide about six volunteers each to the event. This year’s tour features five heritage homes and one newly-constructed home professionally decorated for the self-guided tour. The committee is especially proud that one of the town’s “tower” homes is part of this year’s event. Another heritage home with an addition includes stained glass windows salvaged from the convent in Vankleek Hill.Homes were booked and decorators were organized this past winter, said Sproule, to get things up and running early. Local photographer Wayne Smith of T41 Photography donated his services to photograph each home exterior and take one interior photo for the website. Church organizations have changed up their plans somewhat as well. While two churches are organizing church luncheons, one church is offering morning refreshments and some of the churches are also offering an afternoon stop. The Knox Bell Choir will be performing in the Archie Hardy Hall at Knox, from 2 p.m. to about 2:30 p.m. Refreshments will be offered until 3:30 p.m.
Other churches are organizing entertainment, too. Afternoons will have live music performed at some of the venues, said Sproule. Food tastings will also be on offer during the afternoon at the homes on the tour. To date, Sam’s Kitchen, Vert Fourchette, the Trillium Tea Room and Fresko’s have signed on to provide food samples as you exit homes. Another new feature of this year’s tour is the chance to win a Grand Prize of a 16-place table setting, which includes linens, cutlery, glassware, china and more. Raffle tickets will be on sale for the grand prize: everything on the table, (a value of more than $2,500). The historic wedding re-enactment has been set aside for this year, Sproule relates. But the historical society continues its involvement with the tour by providing histories of each of the homes. A quilt show will be at the Vankleek Hill Museum, which will be open for the day. Specialty vendors have been booked for each home and this year Dale Garvin, known for making dozens of fruitcakes each year to assist a local charity, will be at one of the tour locations. For each fruitcake sold, $5 will go towards the accessible Sacha’s Park Project, to be created in L’Orignal. Go home with your own souvenir of the day’s event by having your group’s photograph taken in a vintage sleigh, furnished for the occasion by Ouimet Farms Adventure, home of our local corn maze. Photographer Jan Amell will take good care of you and see that you are outfitted in Victorian capes, bonnets and the like to have just the right look. There will be a $5 charge to have your photo taken; one half of the proceeds will be donated to the Children’s Hospital of Eastern Ontario. Thanks to Beau’s All-Natural Brewing Company, John Clouston, ReMax Supreme and Pink Bow Tie, three shuttle buses will take visitors from house to house in town and to other locations where special events are happening. To find out where to purchase $20 advance tickets (you can also purchase tickets online), to view the houses, luncheon information and more, visit: www.vankleekhill.ca and select events, then Home Tour. VANKLEEK HILL – Decorators are about to get into high gear to get homes decorated just so for the Vankleek Hill Christmas Home Tour. The annual tradition takes place this year on on Saturday, November 7. “Decorators Lise St. André, Kim Veronneau and Josée Bonneville injected some new ideas and a revitalized direction to the event,” says Sproule. Review staff also kick in time and work to the event; the proceeds are divided among six community organizations each year and in turn, these organizations provide about six volunteers each to the event. The committee is especially proud that one of the town’s “tower” homes is part of this year’s event. Another heritage home with an addition includes glass windows salvaged from the convent chapel in Vankleek Hill during demolition. Homes were booked and decorators were organized this past winter, said Sproule, to get things up and running early. Food tastings will also be on offer during the afternoon at the homes on the tour. Sarah Cole Premium Cider Company, Sam’s Kitchen, Vert Fourchette, the Trillium Tea Room and Fresko’s have signed on to provide samples as you exit homes. Another new feature of this year’s tour is the chance to win a grand prize of a 16-place table setting, which includes linens, cutlery, glassware, china and more. Raffle tickets are on sale now for the grand prize: everything on the table, (a value of more than $2,500). Tickets will also be on sale at the Higginson house (Arbor Gallery), where you can view the table set for 16, prepared by professional decorator Lise St. André. The Vankleek Hill Historical Society continues its involvement with the home tour by providing histories of each of the homes. Volunteers will be outside each of the homes to talk about the home’s history. A quilt show will be at the Vankleek Hill Museum, which will be open for the day. Specialty vendors have been booked for each home and this year Dale Garvin, known for making dozens of fruitcakes each year to assist a local charity will offer his fruitcakes for sale at The Review offices. For each fruitcake sold, $5 will go towards an accessible playground, Sacha’s Park Project, to be created in L’Orignal. Go home with your own souvenir of the day’s event by having your group’s photograph taken in a vintage sleigh. Visit Jan Amell’s new photography studio at 22 Main Street in Vankleek Hill to have your photograph taken on tour day! The sleigh will be furnished for the occasion by Ouimet Farms Adventure, home of our local corn maze. Photographer Jan Amell will take good care of you and see that you are outfitted in Victorian capes, bonnets and the like to have just the right look. There will be a $5 charge to have your photo taken; one half of the proceeds will be donated to the Children’s Hospital of Eastern Ontario. You can visit the Vankleek Hill Christmas Home Tour web page and catch a 45-second video, which was created to air on CTV this week. A PHOTO BOOTH in a VINTAGE SLEIGH? A PHOTO BOOTH in a VINTAGE SLEIGH? Come don luxurious capes, jackets and bonnets from the last century and pose with your friends in a vintage sleigh provided courtesy of Ouimet Farms Adventures. Professional photographer Jan Amell will take your photo and make sure you have a souvenir photo of the fun you had to take home with you! Experience the history of Vankleek Hill! $5 per picture, prints will be available for pick up at the Review later in the afternoon. Half of the proceeds will be donated to CHEO. (Capes, bonnets and shawls will be provided by Grace Clermont). The PHOTO BOOTH location will be uptown (as we like to say here in Vankleek Hill) and will be announced soon. UN KIOSQUE DE PHOTO dans un TRAÎNEAU ANTIQUE? Venez vous costumer avec des capes luxueuses, des manteaux et des bonnets du siècle dernier et faites-vous photographier avec vos amis dans un traîneau antique, une courtoisie de Ouimet Farms Adventures. La photographe professionnelle Jam Amell vous prendra en photo et vous aurez un souvenir de cette journée de plaisir à apporter à la maison! Revivez l’histoire de Vankleek Hill! 5 $ par photographie, qui sera livrée au Review au courant de l’après-midi. La moitié des profits sera versée à l’hôpital pour enfants CHEO. (Les capes, bonnets et châles seront fournis par Grace Clermont). Le KIOSQUE PHOTO sera situé au centre ville (endroit spécifique à venir). November 1, 2014 – At left, Wendy Liston (nee Oswald) was on her way home to Ottawa on Saturday afternoon when she received a telephone call advising her that she was the winner of the grand prize given away as part of the Vankleek Hill Christmas Home Tour. The gift basket, seen in three parts, above, consists of about $500 worth of local products and merchandise supplied by local businesses. The annual home tour is organized by The Review, with support from volunteers from six to eight community organizations. Seen here presenting her with the grand prize is Louise Sproule, publisher of The Review. le 1er novembre 2014 – Wendy Liston (nee Oswald), à gauche sur la photographie, était en route vers Ottawa lorsqu’elle a reçu un appel pour lui apprendre qu’elle était la gagnante du gros lot offert par la Tournée des maisons décorées pour Noël. Le panier-cadeau, en trois parties sur la photographie, contenait des produits et articles offerts par des marchands locaux, une valeur de 500 $. La tournée annuelle est organisée par The Review, avec l’appui de nombreux bénévoles provenant de six à huit organisations communautaires. À droite, Louise Sproule, éditrice du journal The Review, présente le prix à la gagnante.